Walt Rivera spent his teenage years in Santa Fe, New Mexico, and was in his final year of high school when the Soviet Union launched Sputnik. His interest in the space program, his enjoyment of science and math classes, and the encouragement of his family led him to a career in engineering. He received a B.S. 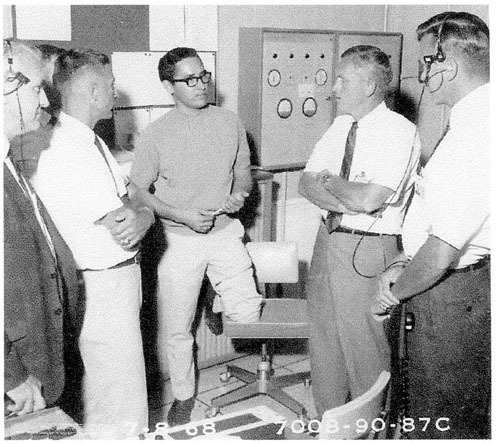 in Mechanical Engineering in 1962 from New Mexico State University. He writes, "In my senior year at the university, we started the interview process with potential employers. Engineers were in big demand, which was primarily due to the many areospace companies doing business with NASA." After considering his options, he decided "on working for the Space Dvision of North American Aviation ... prime Apollo contractor to build the Command and Serivice Modules, Saturn V booster, and integration of the total program ... I reported for work on February 4, 1963 to perform design work on the attitude and service propulsion systems." In all, Walt worked for North American and its successors for 36 years. He retired in June 1999. Throughout his career, he worked as a design engineeer and, later as a manager, on small and intermediate-sized propulsion systems for Apollo, Apollo-Soyuz, and the Shuttle. A fuller account of his career in the space program ( 6Mb ) can be found in a section of a family history he compiled. One of the highlights of Walt's career came in 1972, when microfilmed pages containing the signatures of North American employees ( 8 Mb ) were carried by the crew of Apollo 16 on their flight to the Moon.